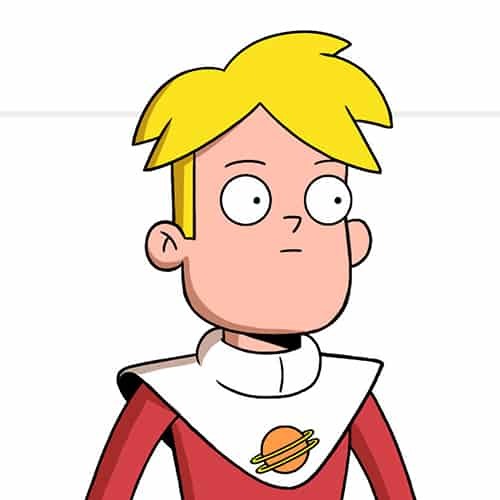 One of the biggest surprise hits in the 2018 television season was the animated series Final Space on TBS. The series was created by Olan Rogers, who originally started the series on YouTube. Conan O’Brien is one of the executive producers. 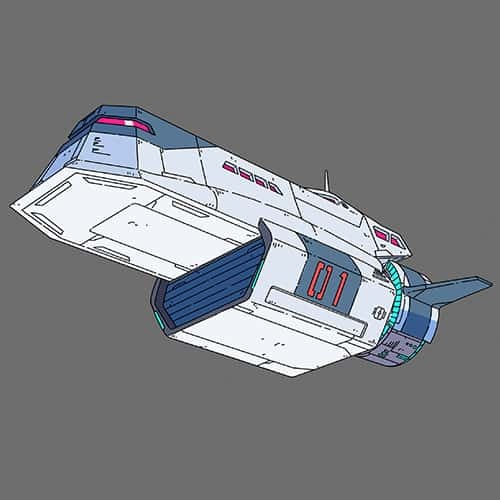 Final Space is the story of Gary, who is finishing a prison sentence for the destruction of a space vehicle, among other things. He is thrust into the middle of a grand scheme of the Lord Commander (voiced by David Tennant) when he bonds with his new friend, Mooncake. From there, the series takes the viewers on an exhilarating journey through time and space as Gary and his crew (Avocato, Quinn, HUE, Mooncake, and little Cato) fight to save the Universe from the Lord Commander. The team behind Final Space brought some of the cast and crew to San Diego Comic-Con for a panel and a press room. The press room proved to be an exciting place as the voice actors and the executive producers discussed the show and, in the case of the voice actors, their characters. Olan Rogers-Series creator, Executive Producer, and voice of Tribore, Gary, and Mooncake. Tom Kenny (the voice of SpongeBob SquarePants) was the first at our interview table. He was funny as well as thought-provoking as he walked us through his thought process for creating the voice of HUE. Tom described how won the role of HUE. He talked about using HAL from 2001: A Space Odyssey as his model for HUE. But, unlike HAL, Tom wanted to imbue HUE with compassion, since it seemed that HUE’s voice would be the last voice Gary would hear as he died in space. 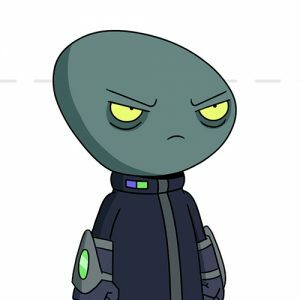 As Tom talked more with our roundtable about Final Space, he discussed specifically how he was chosen for the voice of HUE. When he auditioned for the part, he made use of very specific dramatic pauses in HUE’s speech pattern. It is what Calculon on Futurama was aiming for but rarely achieved. This use of the dramatic pause identified him to the producers as their HUE. It added the human element to the character that they needed, without taking away from the fact that HUE is a sentient computer. Tom hinted at changes to the character of HUE in the second season. After Tom Kenny, David Sacks (The Tick, Third Rock from the Sun, Murphy Brown), executive producer and showrunner of Final Space, provided the press table with insight into the making of the series, as well as a basic history of how he became involved in Final Space. He discussed how the series is able to do comedy, emotion, and action. He described how Gary is able to provide comedy in his failed attempts to win over Quinn. 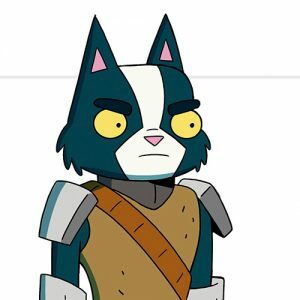 How the death of Avocato grabbed the heart of viewers and how the fight against the Lord Commander provided the action. He explained how they balanced these three elements to create a series which entertain, move, and excite the audience. David further explained that animation can be easier than the live action because it is easier to correct a mistake. However, animation is harder than live action because of the additional forces which have to be marshaled to make animation (voice actors, animators, directors, designers, etc.). David reminded us that not only is Conan O’Brien an executive producer of the series, he also voiced the role of a minor character in one of the episodes. David remarked that Conan has a “special affection for the series” because of the admiration his children have for the show. For the next season, David has promised a slightly slower pace to have more time to tell the story, plus he anticipates that there will be more comedy in future episodes. David asked us who were our favorite characters. He asked us this as a lead-in to discuss the death of Avocato. He told us that if there are no consequences for the characters, the audience would not relate to them. The press at the table agreed with this assessment. Coty Galloway talked about his character, Avocato, who died saving his son, Little Cato. Coty first acknowledged that Avocato is truly dead and even with the jaunts across space and time that are made by the crew, Avocato would not be returning. However, Coty did say that he would be voicing “various” characters in the second season. Coty revealed that Olan Rogers had always planned to kill Avocato, from the beginning of the series, for the dramatic impact. He explained that although the series is animated, Olan wanted Final Space to have a real feeling, by which he meant that there had to be consequences for actions made by the characters. This provided growth for the characters, while at the same time helping the audience identify with the characters more as they had to live with the consequences of their actions. Olan Rogers, the series creator, described the intricate process of creating an animated series: writing the dialogue, doing the table read, storyboard, first color board, and other steps. He loved being at San Diego Comic Con and the incredible energy of the convention. He described how he created the character and voice of Tribore, the alien in love with Quinn. He then went on to explain the creation of the Lord Commander. The Lord Commander is voiced by David Tennant (Dr. Who, Bad Samaritan). Olan related how David Tennant had to audition via Skype and how he tried numerous iterations of the voice before he arrived at the terrifying voice of the Lord Commander. One of the most intriguing aspects of the series is how the prologue was actually the aftermath of a titanic space battle, which left Gary floating in space. Olan explained that the prologue originated with the proof of concept from his web series. He wanted the prologue to be the end of a projected series instead of the beginning. For Final Space, it worked really well. 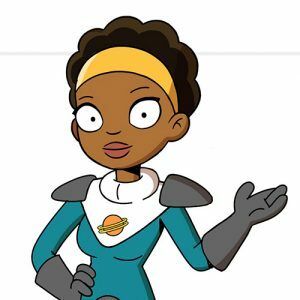 Tika Sumpter voices both Quinn and Nightfall. Tika was excited to be at SDCC, where she finally had a chance to meet the fans who love the work that they are doing on the series. She talked about the impact that characters such as Quinn can have on children, especially young girls. In Quinn, they see a strong woman who is capable and who has a commanding presence. Tika discussed what she brought to the character of Quinn. She gave most of the credit for Quinn’s awesomeness to the writers but she hoped that she brought a certain strength and resilience to Quinn. She then went on to discuss the difficulty of playing two characters where one was the future version of the other. She decided to treat them as two separate characters. She also revealed that the voice actors record their voices separately but they do the initial table read together. Tika provided a wonderful insight into her character(s) and the series. 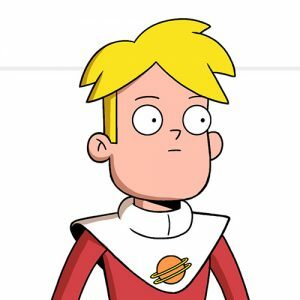 If you have not watched Final Space, you are missing a funny, heartwarming, and exciting show. You can see Season 1 now on demand or on the TBS app. The series has all a fan of animation and science fiction could want: spaceships, aliens, other worlds and dimensions but, perhaps, most importantly, an evil villain out to destroy the universe. And since the evil villain is voiced by David Tennant, who could ask for anything more? Season 2 premieres in 2019 on TBS. ← Next Week in TV 7/29: The ‘Cloak & Dagger’ Season Finale and More! I love going to conventions around the US. I'm an ardent fan of all things science fiction and especially The Expanse. I write for Friends of CC and I have written a science fiction script with a friend. Copyright © 2019 Friends of Comic Con. All rights reserved. Theme: ColorMag Pro by ThemeGrill. Powered by WordPress.